There’s plenty more reasons for getting your camera out in the Caribbean than just turquoise-tinted waters, gleaming white-sand beaches and magical sunsets. We check out the most eye-popping locations in this sun-soaked wonderland located southeast of the Gulf of Mexico and the North American mainland, east of Central America, and north of South America. 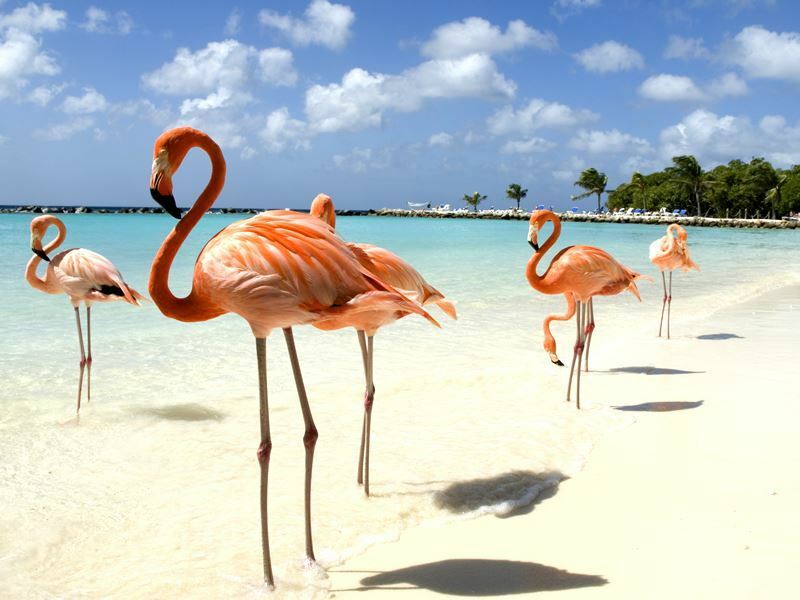 Given that flamingo selfies are a huge social media trend, there’s nowhere better to pose with these pink-feathered stunners than Aruba. But it’s not a case of rocking up at any old beach to grab a selfie with these photogenic creatures (they are named after the Latin word 'flamenco' which means fire, referring to their eye-catching candy colouring). Meet-and greets are only available on the private 40-acre island owned by the Renaissance Aruba Resort & Casino; a luxe hideaway on the west coast near the capital, Oranjestad. Luckily, you don’t have stay here to be tickled pink. A maximum of 30 guest adult passes are issued daily for $99 per person (this includes lunch, a drink, ferry transfers, and use of the beach). Once you’ve perfected your shots of hammocks, cocktails, swaying palms, and cute-as-you-like flamingos, keep your eyes peeled for iguanas, hermit crabs, and beach-loving birds. Also look out for the iconic Divi-Divi trees that are easy to spot thanks to their wind-sculpted shape and Medusa-like branches. Get the shot: Given that they don’t migrate like their wilder relatives, you can get up close and personal with these Renaissance Island residents all year round. They are also very happy to join you for a dip in the bathtub-warm Caribbean waters - or eat out of the palm of your hand. Either way, you’ll never want to be photographed with an inflatable pool toy flamingo ever again. 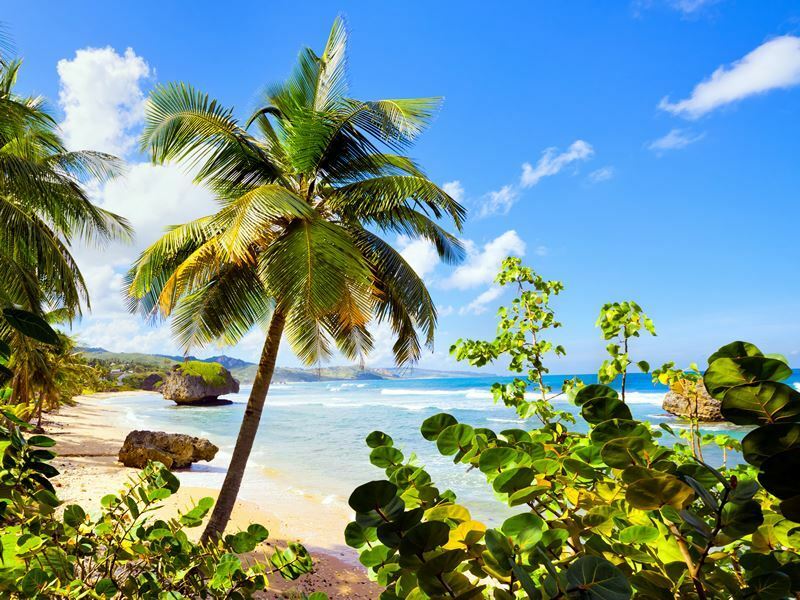 Named for the wife of King David (she apparently caught his eye when she was bathing in milk), Bathsheba Beach is the arresting slice of shoreline turned surfing hotspot on Barbados’ rugged east coast. Everything here is worth photographing: gleaming sands, giant wave-battered boulders, swaying palms, and foamy Atlantic waters. The beach also lures surfers from across the globe to its adjacent swell known as the Soup Bowl - an epic right-hand point break that hosts regular local and international surfing competitions. Once you’ve zoomed in on the boarders, spend time on the sand or in the shallow tide pools (the only cooling-down option as these waters are not safe for swimming). Facilities are limited, but there’s free parking, toilets, and a couple of rum shacks within walking distance. 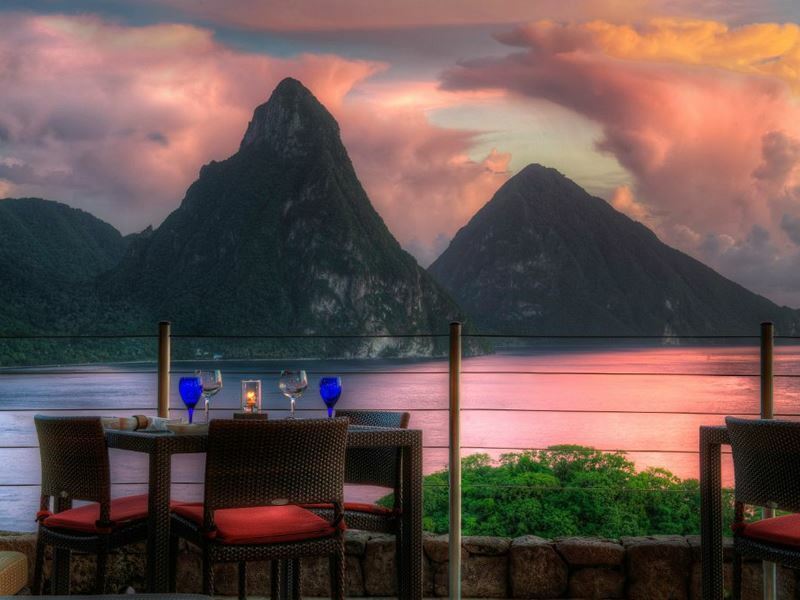 When hunger calls later in the day, head to the 150-year-old Round House Inn for Caribbean style dishes with locally-sourced ingredients, hand-selected wines and cocktails, and some of the most incredible views the island has to offer. Get the shot: Named for the frothy surf, the Soup Bowl is best visited in winter (November to May). This champion-approved spot is perfect for images of steady big rollers as well as fantastic curves that allow surfers to perform all sorts of manoeuvres. You may even see the likes of surfing greats such as Kelly Slater, Taylor Knox, and the Malloy brothers filming surf videos here. There’s fewer more bliss-bringing places for photographers than Exuma - the star-studded archipelago of 365 cays and islands just 35 miles southeast of Nassau. Life here life revolves around floating and boating on the clear blue-green waters, admiring kaleidoscopic marine life on snorkelling adventures, being wowed by the Mile-Long Sandbar, and staking out the rich and famous (many celebrities own private homes and beach-side condos here). But it’s the swimming pigs of Big Major Cay (also known as Pig Beach) that get all the glory. Nobody knows how these seriously cute pink and dark brown porkers actually got here (the cay is uninhabited and the animals are not native to the Bahamas) but rumour has it they were left by sailors who planned to return and use them for food - but they never came back. There’s about 15 pigs and piglets in total, all of whom are happy to laze on the sand, wander around the island, rush to meet tourist boats in the hope of food, show off their swimming skills, and pose for selfies. 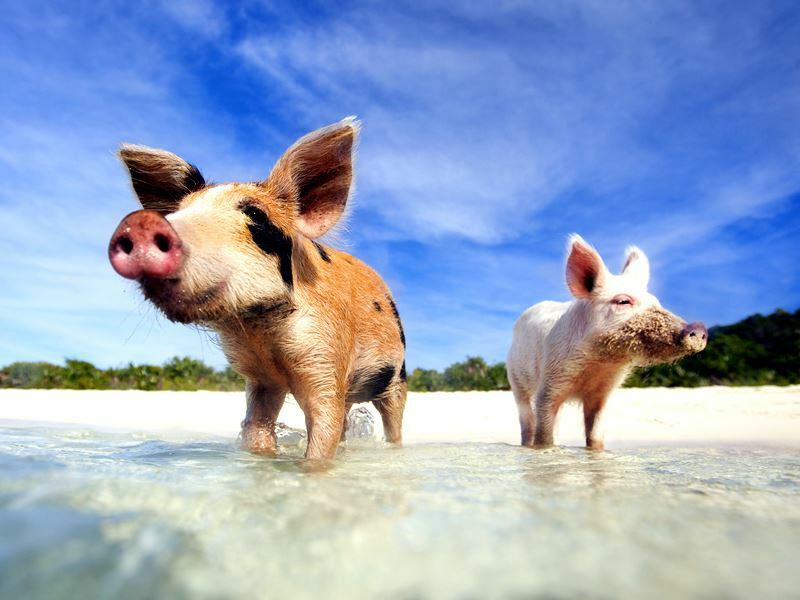 Get the shot: Although the pigs are established social media stars (they even have their own book, Pigs of Paradise, published in 2018), watching them doggy-paddling in the Caribbean Sea makes for hard-to-believe photos. Take as many pictures as you want, but if you want to swim with them stay further off shore where you can stand up. And don’t be tempted to feed them. Probably the most photogenic port in the Caribbean, St. George’s horseshoe-shaped Carenage (the French word for safe anchorage) is a working inner harbour filled with colourful fishing boats and fringed by warehouse bars, waterside cafés, excellent seafood restaurants, and restored Georgian government buildings. Once you’ve admired the scenery and watched the locals going about their daily business, head to the nearby market for a dazzling display of fresh fruit and vegetables, local crafts, and island-grown spices such as cinnamon, cloves, mace, and nutmeg (take your camera for sure, but respect that the stallholders do not like their pictures taken without being asked). 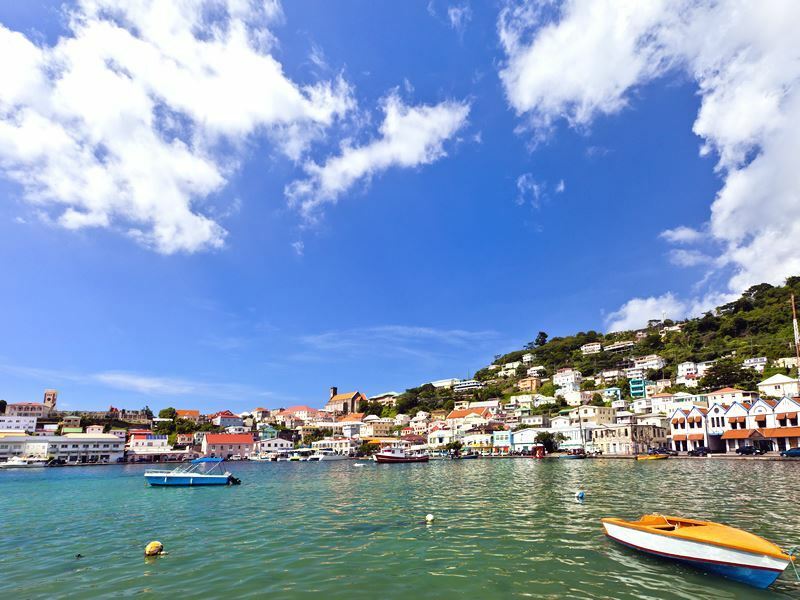 Elsewhere, stroll around the narrow streets, marvel at the stone churches and houses with terracotta tiles and galvanised roofs, and learn about the island’s original indigenous inhabitants at the Grenada National Museum housed in a building built by the French in 1704 as army barracks and later used by the British as a female prison. Get the shot: For superb shots of Careneage, head to the viewing platform at the 175-foot-high Fort George. Established by the French 1705, this colonial-era complex features working cannons (they fire on special occasions), a series of defensive tunnels, and 360-degree views. Some areas are open to the public between 7am and 5pm for a small entrance fee. For oh-my photos of Antigua’s beautiful English Harbour and the stunning Nelson’s Dockyard, nothing beats Shirley Heights. Named after Sir Thomas Shirley, the Governor of the Leeward Islands who strengthened the island’s defences in 1781, this 490-foot military lookout and gun battery set on a hilltop at the island’s southernmost tip is accessible by car or by walking the tough-but-rewarding Lookout Trail from Galleon Beach. And while the gun emplacements, fortifications, and ruined military buildings are all worthy of your attention, it’s the Shirley Heights Lookout Restaurant & Bar in the former guardhouse that’s the star attraction. Head here between 4pm to 10pm on a Sunday for the Shirley Heights Party - a lively affair complete with live bands playing steel drums, reggae and calypso music, a delicious barbecue, and rum punch galore. There’s also a dedicated viewing platform from which you can watch the sun dip down behind the hills (on a clear day, the islands of Guadeloupe and Montserrat loom in the distance). 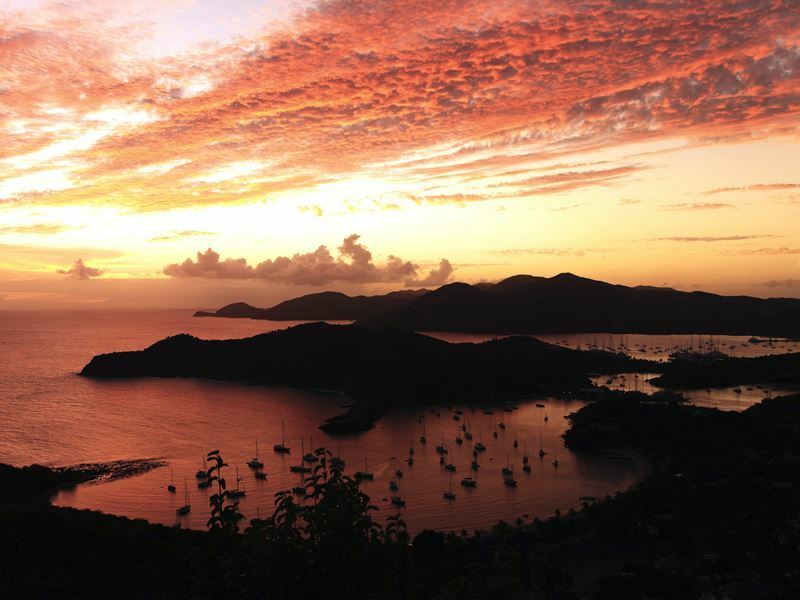 Get the shot: The panoramic views of Antigua’s southern coastline from Shirley Heights are some of the most magical in the Caribbean - especially at sunset when the harbour lights glisten below. Weather depending, you’ll also get some impressive shorts of Galleon Beach, Falmouth Harbour, and the remains of Fort Berkeley - the fort built in 1704 to defend English Harbour. 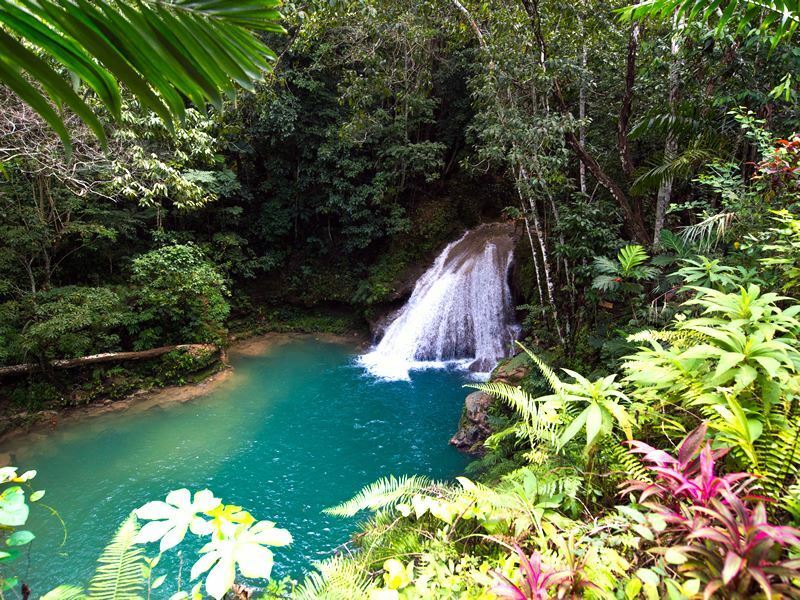 Set high up in the mountains above the buzzy resort town of Ocho Rios, the heart-stirringly beautiful Blue Lagoon (known as the Blue Hole by locals) is the mineral pool made famous by the 1980’s movie starring Brooke Shields. Surrounded by lush greenery and fed by underground freshwater springs, experts proclaim it to be approximately 200 feet at its deepest point. Watching the water change colour throughout the day is mesmerising; expect glorious shades of turquoise, royal blue, and jade green depending on the sun’s setting and reflection. Most head here to laze by the water’s edge, marvel at the 20-foot cascading waterfalls, jump off the cliff directly into the hole, or swing into the water from a Tarzan-style rope (the less adventurous can climb down a ladder to swim). You can also max out on photo ops by exploring small caves, hiking along the river, and covering yourself with mud. While there are no on-site facilities, you’ll be able to buy coconut water and Red Stripe beers from one of the lone vendors. Get the shot: While Blue Lagoon boat tours and rafting trips are available, the best photos are from the water. Also squeeze in a couple of hours to visit Dunn’s River Fall, the iconic series of cascades outside Ocho Rios that stand at 180-feet high and stretch over 600-foot in length. Watching the “human chain” of handholding climbers makes for fun imagery. 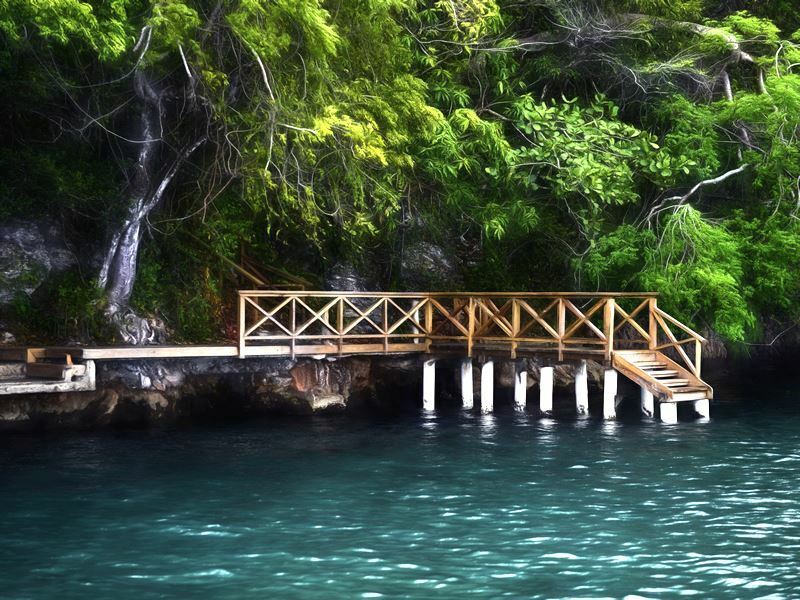 For eco adventures on an epic scale, Los Haitises National Park (meaning hilly land in the Taino language) is the 618-square-mile wonderland located below the Samaná Peninsula on the Dominican Republic’s northeast coast. The landscape is joyous; not least for the magnificent and much-photographed series of 98-foot-high rock formations jutting out of the emerald-coloured waters. You’ll also find lush rainforest, extensive mangroves, and multiple caves with some of the highest numbers of petroglyphs and pictographs in the country (most famous are La Línea and El Arenal). And the wildlife’s pretty impressive too, given there’s over 200 species of birds including the endangered Ridgway’s Hawk, the Hispaniolan Parrot, the Hispaniolan Emerald, the white-necked crow, and the broad-billed Tody. You’ll also spot dolphins, manatees, dozens of different types of critters (mostly reptiles, amphibians, and snakes) and indigenous little mammals such as the Hispaniolan Solenodon and the Hispaniolan Hutia. Get the shot: Once you’ve sailed around the park’s mangroves and hiked the trails that connect the beaches, caves and forests, head to the Dominican Republic's capital city of Santo Domingo. Officially the oldest city in the New World, visual thrills include medieval palaces, fortresses, glass skyscrapers, pristine beaches, and monuments with a real sense of history. 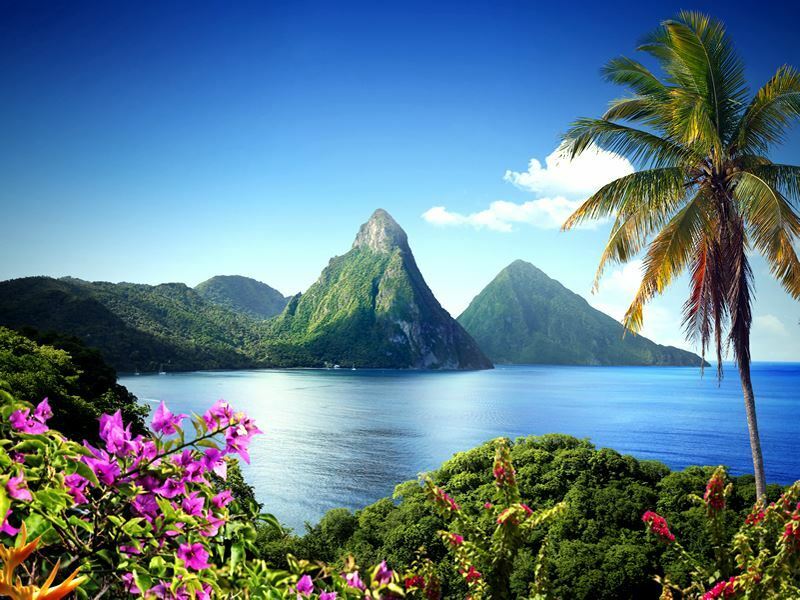 So picture-perfect are St. Lucia’s green and jagged-edged Gros and Petit Piton, swanky resorts have removed entire walls in guest rooms to maximise views. Known simply as the Pitons, these geologic icons that rise side-by-side from the sea are located just south of the town of Soufrière on the island’s west coast. Formed thousands of years ago by volcanic activity, they are the most famous mountain pair on the planet - finally making it onto the UNESCO World Heritage Site list in 2004. Unsurprisingly, these unofficial icons are a huge draw to photographers and hikers - many of whom favour climbing the taller 2,530-feet Gros Piton rather than the shorter and more challenging 2,438-foot Petit Piton. If you’d rather stay at ground level, what’s most interesting is how the duo’s appearance changed dramatically when viewed from different directions. From the south the mountains look much farther apart than they do from the north (which is the classic view in which the mountains appear like near-identical twins nestled close together). Get the shot: Once you’ve photographed this magnificent pair from every conceivable angle, head to the nearby Sulphur Springs - the world’s only drive-in volcano. The scenery is as otherworldly as you’d expect, not least for the craters, sulphuric gases, incredible hues of pinks, yellow, greens, and whites, and pools of mud that you can actually bathe in. 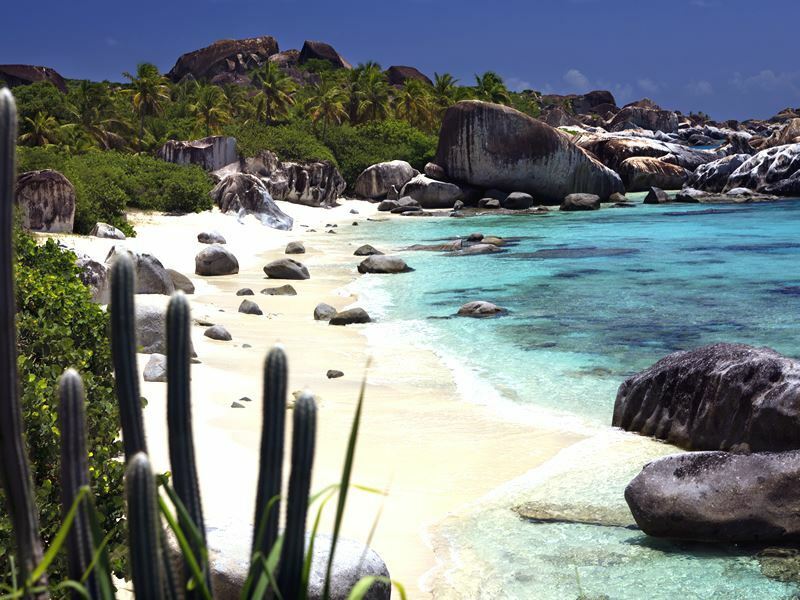 A geological wonder comprised of giant granite boulders that form a network of sheltered tide pools, tunnels, grottoes, and arches on the beach's edge, The Baths is the not-to-be-missed attraction in Virgin Gorda - the third-largest of the British Virgin Islands and possibly it’s most beautiful. This place really is like nowhere else on the planet; not least because it’s accessed through tiny openings between the rocks. You’ll then spend the next 20 minutes climbing up wooden ladders, wading through tidal pools and coves, and clambering over boulders. But the pay-off is worth it for sugar-soft white sands and crystal-clear waters that are perfect swimming - especially at Spring Bay, Little Trunk, and the ever-popular Devil’s Bay. The place gets packed out with cruise ships visitors, so it’s best to arrive here first thing in the morning or late afternoon. When you’re done exploring, head to Top of the Baths Restaurant near the car park for Caribbean fusion cuisine, ice-cold local beers, and fabulous island views. Get the shot: You’ll need at least a couple of hours to explore The Baths, probably double that if you want to spend time swimming and snorkelling. Also save space on your camera for a shots of the Cathedral Room - a natural pool on the trail to Devil’s Bay formed by the intersection of two large rocks that allow in sunlight (choirs love it here for the amazing acoustics). Looking like something out of a photoshoot, the oldest neighbourhood of Cuba’s capital has plenty to show off. Known as Old Havana, it amazes with great avenues, main plazas (Plaza de Armas, Plaza Vieja, Plaza de San Francisco, Plaza del Cristo, and Plaza de la Catedral), and interesting architecture in a wealth of design styles (Art Deco, Baroque, Art Nouveau, and Neoclassical). In addition to a kaleidoscope of crumbling buildings and vintage cars, highlights include Catedral de San Cristóbal de la Habana, the Museo de la Ciudad, El Capitolio, Castillo de la Real Fuerza, and Calle Obispo - home to El Floridita where Ernest Hemingway was partial to a few frozen run daiquiris. Later, hit the road to explore the agricultural heartland of Viñales Vally in Pinar del Rio. Just a four-hour drive from the city, this lush green valley surrounded by mountains is home to Cuba’s cigar-making industry and wows with bright green tobacco fields, soaring pine trees, and giant top-rounded limestone karsts called ‘mogotes’. Get the shot: While everywhere in Old Havana demands a photo, it’s the meticulously preserved Chevrolets, Buicks, and Plymouths that are most appealing. 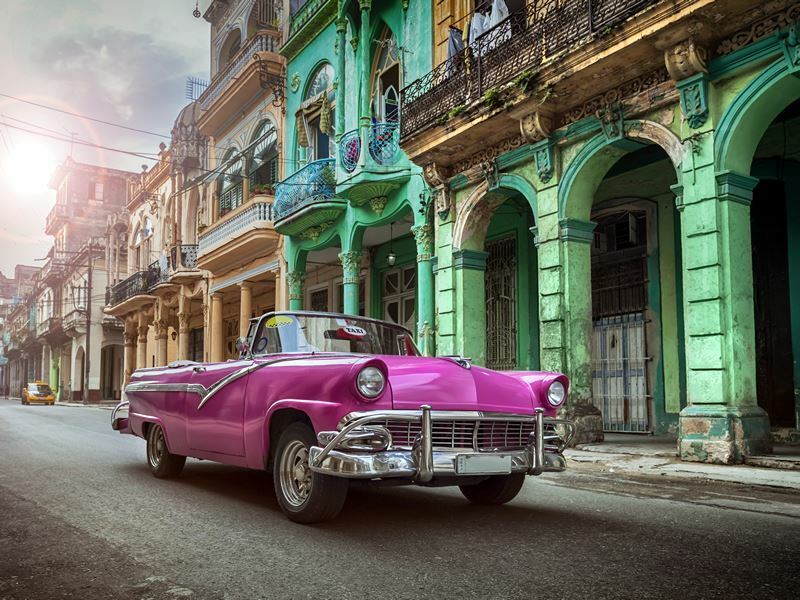 Throwbacks to when Fidel Castro led the Communist Revolution of 1959, these brightly-coloured treasures clunking around the city’s streets provide crucial income for locals while thrilling the tourists.